Silver coins formed the backbone of currency in the Roman Empire and are likely to have been the main media for long-distance monetary exchange. Imperial fiscal policies and financial problems can be detected through metallurgical analysis of imperial silver coinages. Roman emperors manipulated the silver content (fineness) of the coinage to solve short-term financial problems frequently caused by government overspending. For the most part, this manipulation involved the reduction of the silver content of the coinage â debasement - in conjunction with a drop in weight. In the 1970s an important study was published by D. R. Walker of Oxford, documenting the silver contents of Roman Imperial silver coins by X-ray fluorescence analysis (XRF) (Walker 1976-78). This appeared to be a definitive study of the subject, and until recently was the principal authority and reference for economic historians on the monetary policies of the Roman empire. However, during the late 1980s it was realised that there were serious problems with Walkerâs data. These can be attributed to a faulty technique of analysis; Roman silver coins were produced from an alloy of silver and copper, which was deliberately treated in antiquity to remove some of the copper from the surface of the coin, giving impure coins the appearance of being pure. Walker had analyzed only the surfaces of coins, and assumed that this was representative of the entire objects, with the result that his figures for the silver content are far too high and very variable. 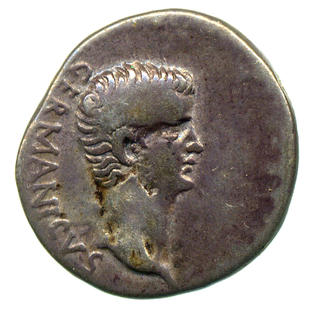 In 1995 the silver coinage of the Flavian Emperors issued for the city of Caesarea in Cappadocia were the subjects of an initial enquiry where samples of metal were drilled out from the interior of a representative series of coins (Butcher and Ponting 1995). Several of the coins so analysed were the same specimens as had been analysed by Walker for the âMetrologyâ and served to underline the problems with the use of 'non-destructive' analysis of silver coins. The analytical technique used for this project was atomic absorption spectroscopy (AAS), which, in addition to the silver and copper in the alloy, is also capable of measuring several minor and trace elements. These additional data enabled more detailed characterization of the alloys used for the coinage and this in turn has allowed the identification of changes in mint operation and location to be identified. Some small projects using this approach followed, investigating aspects of the silver coinage of Trajan and Septimius Severus (Butcher and Ponting 1997 and 1998). This further demonstrated the potential of the methodology for addressing many of the questions about how Roman silver coinages functioned and related to one another. In 2001 funding was obtained from the Leverhulme Trust (Grant No. RF&G/6/2002/0336) and the Faculty of Arts and Sciences Research Committee and the University Research Board of the American University of Beirut, Lebanon to undertake a one year project to apply this methodology to the coinage of the first Imperial dynasty, that of the Julio-Claudians. A more sensitive analytical technique was employed, inductively-coupled plasma atomic emission spectrometry (ICP-AES), that enabled much better quality data for important trace elements, such as arsenic, tin and bismuth, to be obtained. Silver and copper concentrations continued to be measured by AAS. In addition, scanning electron microscopy (SEM), micro-analysis (SEM-EDS) and optical microscopy (metallography) were employed to investigate methods of blank production and the effects of burial. A small number of lead isotope analyses were also undertaken by laser ablation multi-collector inductively-coupled plasma mass spectrometry (LA-MC-ICP-MS) (Ponting et al. 2003). The results of this project appear in a number of publications (Butcher and Ponting 2005a and b; 2009). In 2006 a second stage of the project was awarded funding from the Arts and Humanities Research Council (AHRC) over three years (Grant ID: 119434). This project used the same suite of analytical techniques to investigate a much larger number of coins, including an expanded programme of lead isotope analyses (by thermal ionisation mass spectrometry). The first stage of this project resulted in a number of journal publications and contributions to edited volumes (Butcher et al. 2009; Butcher and Ponting 2012; Ponting 2009 and 2012). In 2014 a substantial monograph will be published that brings together and discusses the results from all the above projects covering Roman Imperial silver coinage up until the Reform of Trajan. It is the raw data upon which this monograph is based that are archived here. Work is underway for the second monograph taking the story up to the death of Commodus and the analytical data upon which this is based will be archived here in due course. K. Butcher, 1992 'Rhodian Drachms at Caesarea in Cappadocia' Numismatic Chronicle, 41-48. K. Butcher, 2012 'Syria in the Roman period, 64 BC-AD 260', in W. Metcalf (ed. ), The Oxford Handbook of Greek and Roman coinage, Oxford: OUP, 468-484. K. Butcher, M. Ponting, 1995 'Rome and the East: Production of Roman Provincial Silver Coinage for Caesarea in Cappadocia under Vespasian, AD 69-79', Oxford Journal of Archaeology 14.1,65-77. K. Butcher, M. Ponting, 1997 'Silver standards at Caesarea in Cappadocia', in J. Nollé, B. Overbeck, P. Weiss (edd. ), Internationales Kolloquium zur kaiserzeitlichen Münzprägung Kleinasiens. 27. - 30. April 1994 in der Staatlichen Münzsammlung, München, Nomismata: Historische-numismatische Forschungen 1, Milan, 167-171. K. Butcher, M. Ponting, G. Chandler, 1997 'A Study of the Chemical Composition of Roman Silver Coinage, AD 196-197' American Journal of Numismatics 9, 17-36. K. Butcher, M. Ponting, 1998 'Atomic Absorption Spectrometry and Roman Silver Coins', in A. Oddy, M. Cowell (eds. ), Metallurgy in Numismatics, vol. 4, London, Royal Numismatic Society Special Publication no. 30, 308-334. K. Butcher and M. Ponting, 2005a 'The Roman denarius under the Julio-Claudian emperors: mints, metallurgy and technology', Oxford Journal of Archaeology 24.2, 163-197. K. Butcher and M. Ponting, 2005b 'Fiduciary or intrinsic? The Egyptian billon tetradrachm under the Julio-Claudian emperors', Schweizerische Numismatische Rundschau / Revue Suisse de Numismatique / Rivista Svizzera di Numismatica, 84. K. Butcher, M. Ponting, J. Muona, 2009 'The Denarii of Otho: a Stylistic and Compositional Study', Rivista Italiana di Numismatica 110, 297-316. K. Butcher, M. Ponting, 2014 The Metallurgy of Roman Silver Coinage: from the Reforms of Nero to the Reform of Trajan. CUP. Gitler, H. and Ponting, M. J. 2003 The Silver Coinage of Septimius Severus and his Family (AD 193-211); a Study of the Chemical Composition of the Roman and Eastern Issues. Milan: Ennerre. Ponting, M. 2009 'Roman Silver Coinage: Mints, Metallurgy and Production', in A. Bowman and A. Wilson (eds. ), Quantifying the Roman Economy: Methods and Problems, Oxford: OUP, 269-280. Ponting, M. 2012 'The Substance of Coinage: the Role of Scientific Analysis in Ancient Numismatics', in W. Metcalf (ed. ), The Oxford Handbook of Greek and Roman coinage, Oxford: OUP, 12-30. Ponting, M. J., Evans, J. A. and Pashley, V. 2003 âFingerprinting of Roman Mints using Laser-ablation MC-ICP-MS Lead Isotope Analysisâ, Archaeometry 45. 4. 591-597.